One of our favorite partners is The World Is Fun, a local non-profit that connects people with great Seattle community events and organizations. They’re having their annual fundraising auction this week and it’s going to be a great evening. You should be there. All proceeds go to support the great work they do. General admission is $35 (cocktails and appetizers) and they’re auctioning off all kinds of great prizes, like Ken Jennings (of Jeopardy fame) joining your trivia team, get your own flavor of ice-cream on the menu at Full Tilt, behind the scenes tours of the Woodland Park Zoo, DJ for a day on 92.5, and many more. Here at Ignite Seattle, our city’s largest open platform for citizens to share their stories, a small team of volunteer organizers makes our sold-out shows happen. Thanks to you, our fans, our events have become so popular now that we’re looking to grow our team. If you’re not familiar with what our events are like, this short video explains it well. The event producer for Ignite Seattle is the master of the back of the house at our events. They coordinate with our MC, volunteer wrangler and other organizers to plan each show, and then work directly with our venue to ensure everything goes smoothly. During the evening they are the primary showrunner (with help as needed from the MC and other organizers), to make sure people, equipment and fun are in the right place at the right time. They need to excel at planning, communication and real-time project management, and also have a love for live cultural and civic events. As part of the organizing team, the producer may collaborate with the team (using Slack) between events to find speakers, improve our relationships with other organizations and help improve the quality and thoughtfulness of all our creations (website, videos and other media). We do three events a year and all of our events are in the evening (usually Thursday night). As one of the premier live events in Seattle we need a web and digital presence that captures the fun, challenging and community building energy of our shows. As design master you’d lead the way in designing and building a web experience that enables visitors to easily find interesting talks from our past events and that helps sell tickets for upcoming ones. You’d also refine our brand and visual style, improve or create designs for our logos, t-shirts, slides and other digital and print materials. You’d get high-autonomy, clear goals, a fun team to work with, and a way to use your significant talents for good. We excel at making the most out of our events, working mostly with volunteers to make everything happen. Yet we do have basic accounting tasks, including paying bills, collecting ticket revenue (from our venue partners) covering expenses, and doing non-profit accounting and planning, things most of us have only minor experience with. We need an experienced bookkeeper to track our income and expenses, help us make sure we pay our vendors on time, and improve our financial planning and basic accounting. 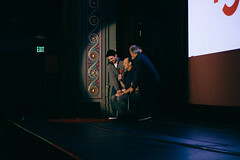 For years we’ve filled Town Hall Seattle, and now, The Egyptian theater, with sold out shows that provide a great platform for the amazing stories, projects and ideas Seattle citizens are working on. We want to extend that platform to include a handful of select sponsors, trading resources we can use to improve our shows, for premier exposure to our audience and community. The role would be to define our sponsorship program, recruit sponsors and manage ongoing relationships with them. Minimum time commitment: a couple of hours a week between events, with spikes of 5-10 hours a week leading up to and during the events (3 times a year). 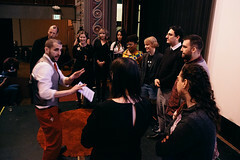 Rewards: You’ll be part of a fun, smart and loyal team of volunteer organizers, well connected in the Seattle tech and arts community. You will meet many interesting and amazing people, work with a great team, and share in thrills at each live event. You’ll get to use skills you already have to do good in the arts community in Seattle. Ignite Seattle will likely be one of the most rewarding things you contribute to regularly. How we work: We are mostly virtual (Slack), with monthly in-person meetings, and more as needed or when we get closer to the next event. We are all volunteers and happily wear many hats. You may get your hands dirty often, and have fun doing it, as we are a small, lean team. Tell us what you love about Ignite Seattle, and/or why you want to join the team?